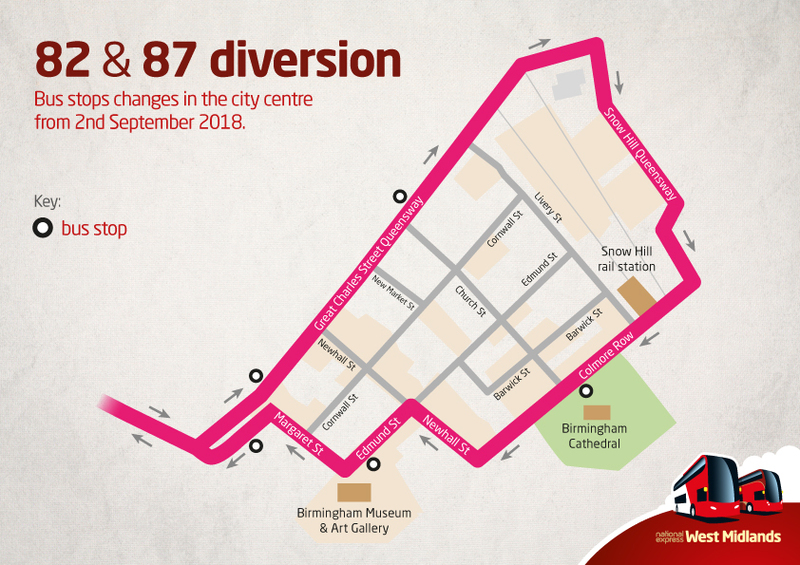 From Sunday 2nd September 2018, a number of services will be diverted due to the extension of the West Midlands Metro in Birmingham city centre and the 2018 Conservative Party Conference. Construction works to extend the West Midlands Metro from Victoria Square to Centenary Square begin on Sunday 2nd September 2018, and are expected to last until summer 2019. This will involve the closure of Paradise Circus, with some sections of Broad Street and Suffolk Street Queensway also being closed to traffic. The A38 underpass that runs underneath Paradise Circus will remain open in both directions during this time. Throughout this period some services will be diverted or have amendments made to bus stop locations. These changes may also cause some journey times to be extended. Please read the below information to find out how your route will be affected. Between these dates, services travelling into and out of Birmingham city centre will be affected by diversions, due to the partial closure of Broad Street and closure of Suffolk Street Queensway. Services travelling into Birmingham city centre will be diverted at Five Ways and take the exit onto Islington Row Middleway, serving the Frederick Road stop. These services will turn left onto Tennant Street, right onto Bishopsgate Street and then left onto Bath Row where they will serve the Bexhill Grove stop. From here they will continue to Holloway Circus, serving the Granville Street and Ernest Street stops along the way. At Holloway Circus these services will go over the roundabout to Smallbrook Queensway and serve stop, then St Martins Queensway, serving New Street Station opposite Boots/Bullring. They will then continue to Moor Street Queensway to stop MS4 where passengers can alight for Moor Street Station, then turn left onto Carrs Lane, right onto High Street, left onto Bull Street and right onto Corporation Street, where they will terminate outside The Square Peg. Services travelling out of Birmingham city centre will begin from outside The Square Peg, from here they will turn left onto The Priory Queensway, right onto Colmore Circus Queensway and right onto Colmore Row to serve the bus stop. They will then turn right onto Newhall Street, left onto Edmund Street, serving stop ES1, turn right onto Margaret Street and then left onto Great Charles Street Queensway to serve stop GC1. From here these services will continue around Great Charles Street Queensway, via Paradise Circus Queensway to Cambridge Street where they will serve a temporary stop behind Baskerville House. Once over the roundabout, these services will serve the stop behind the ICC by the Prince of Wales, then continue over the bridge to King Edwards Road, take the first exit at the roundabout to St Vincent Street, then turn left onto Sheepcote Street and serve a stop by the Arena car park. These services will continue down Sheepcote Street to Broad Street, serving a stop behind the Hilton Garden Inn before turning right onto Broad Street, where two further stops will be served before continuing along the normal line of route from Five Ways. For a visual guide of this diversion, click on the map below to view. Between the above dates, services 82 and 87 will terminate at Colmore Row. Services will not be able to serve the following stops: Suffolk Street Queensway, Smallbrook Queensway, St Martins Queensway, Moor Street Queensway and Corporation Street. 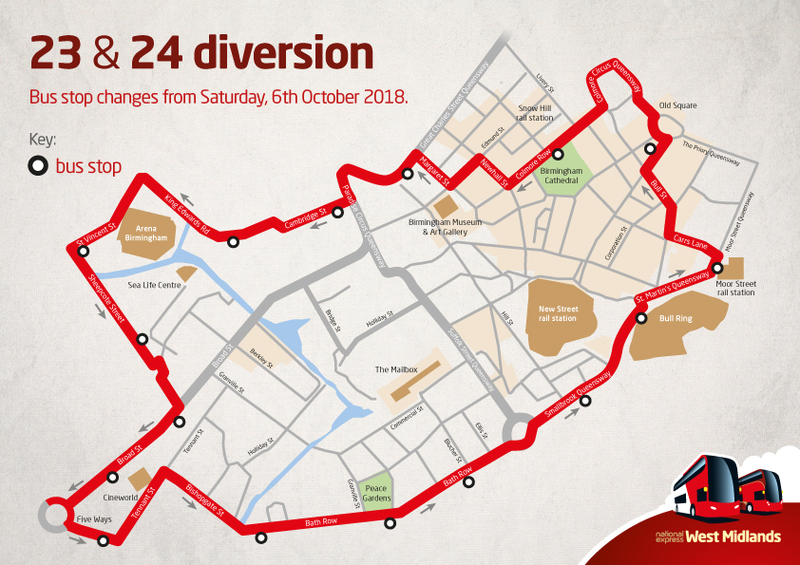 The 82 and 87 will be diverted from Parade and will join Great Charles Street Queensway, continue to Snow Hill and serve temporary stops GC3 and GC4 along the way, turn right onto Snow Hill Queensway, turn right onto Colmore Row Queensway, and then terminate at Colmore Row. Customers needing to travel to Birmingham Markets, Moor Street Station or the Bullring are able to change onto the 16 service at Snow Hill. Services travelling into Birmingham city centre will continue to use the underpass below Five Ways as usual, and will serve stop BR7. 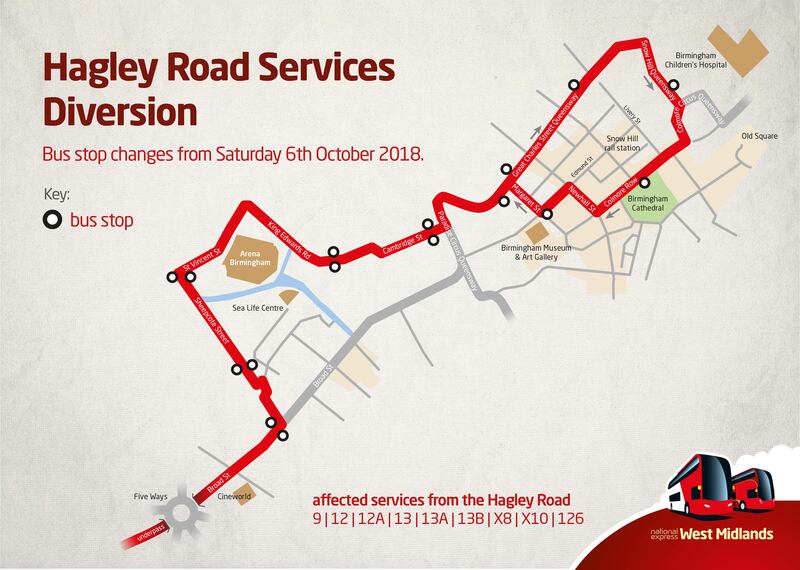 Buses will then be diverted via Sheepcote Street where they will serve two temporary stops, turn right onto St Vincent Street, and then turn right at the roundabout onto King Edwards Road. At Cambridge Street buses will serve stops by the Prince of Wales and behind Baskerville House, before turning left onto Paradise Circus Queensway and joining Great Charles Street Queensway. These services will continue to Snow Hill, observing stops GC3 and GC4 along the way. At St Chads Queensway, buses will turn right onto Snow Hill and serve a stop here before continuing via Colmore Circus Queensway to Colmore Row, where these services will terminate. Services travelling out of Birmingham city centre will begin at Colmore Row, where they will then turn right onto Newhall Street, left onto Edmund Street where stop ES1 will be served, turn right onto Margaret Street and then turn left onto Great Charles Street Queensway, to serve stop GC1. These services will continue around Paradise Circus Queensway and turn right onto Cambridge Street, where stops behind Baskerville House and near the Prince of Wales will be served, before joining King Edwards Road. Buses will continue down King Edwards Road and turn left at the roundabout onto St Vincent Street, left onto Sheepcote Street, serving stops by the Arena car park and by the junction with Grosvenor Street, before turning right onto Broad Street. In Broad Street, buses will observe stops outside the Hampton by Hilton, before continuing under Five Ways and along the normal line of route. This service will no longer serve stop SH4 on Livery Street, but will terminate and begin at stop SH6 instead, located a short walk away. Services travelling out of the city will not serve stop NS9 on Smallbrook Queensway, they will instead call at stop NS3, located a short walk away outside Boots, opposite New Street Station. Services travelling out of the city centre will no longer serve stop NS4, but will call at stop NS3 instead, also located outside Boots. Stop NS9 will not be served at all by these services, anyone wanting to board or alight will need to use stop NS3 outside Boots, opposite New Street Station. This service will not serve stop SH1 on Colmore Row, it will instead begin and terminate from stop SH4 on Livery Street. A new timetable has been created to reflect this change. Services travelling into the city centre will go via Wheeleys Road, St James Road, George Road, connect to Bath Row via a new bus gate and then continue to Holloway Circus.